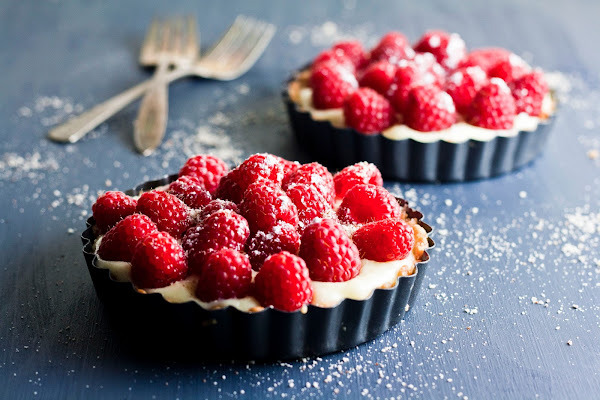 Before we get to my awesome recipe for raspberry cheesecake tartlets, allow me to just ramble at you for a little bit. Because there are so many exciting things to discuss on the blog today! First and foremost, internet aficionados out there know that next Monday, July 1st, Google Reader is shutting down. Womp womp. Why can't Google Reader just stick around?! Sob. I've been using Google Reader since 2010, and, despite my best efforts, I haven't really found an alternative that's worked for me. Lots of people recommended Feedly, but it's a little too flashy for me — I really loved the simplicity of Google Reader. I'm thinking of going the Newsblur route since its interface is pretty similar to Google Reader, but Newsblur limits the number of blogs you can subscribe to unless you shell out for an annual subscription. And although it's only $24 bucks per year, I'm feeling a little broke because I just bought a new camera. That's right, I bought a new camera. That's the most exciting piece of news I have today — I finally shelled out and bought a much coveted Canon 5D Mark II! I'm incredibly excited since I've been using a refurbished Canon Rebel XSi from 2008 this entire time. Admittedly the Rebel has served me well (I've even decided to keep it as a backup camera, despite the fact that it's probably worth some money on eBay), but there was definitely a point in my photography where I felt like I was hitting a wall because my camera's technical capabilities were pretty limited. I chose the Canon 5D Mark II not only for several technical and supremely boring reasons, but also because it was recommended by all the food photographers I admire and aspire to be. I know that there's a newer, upgraded version of the 5D out (aptly named the Canon 5D Mark III), but the thought of spending $3000+ on a new camera frightened me. For now, I was happy to settle for a refurbished 5D Mark II (which, trust me, wasn't exactly cheap either). As for the camera itself, the Canon 5D Mark II is scary and intimidating and exciting and fun. I feel like I just jumped from driving my 10-year-old soccer-mom car from high school to driving a million-dollar, breakneck speed Ferrari race car. I'm embarrassed to admit that, at first, I didn't even know how to take photos with the 5D. But after pouring through the three — yep, you read that right, THREE — instruction manuals it came with, I finally got the hang of it and decided to head outside to take photos of the raspberry bush in my garden. Perhaps that's a piece of news that's more exciting than a new camera for my readers — the fact that I discovered that my janky house apartment has a huge, fruiting raspberry bush in its back yard. 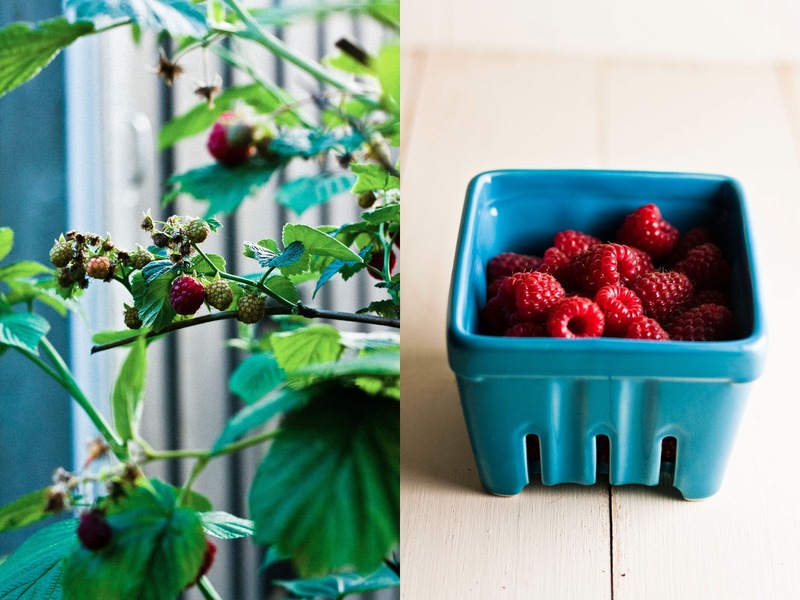 I credit my boyfriend Erlend for discovering that what we thought was an overgrown shrub (that our downstairs neighbors desperately needed to maintain, ehem) actually bore raspberries. Lots and lots of them. In less than five minutes, I was able to fill up a pint's worth! It's really exciting to have a fruiting bush in my backyard. As I stood in the dusk and filled my porcelain pint container full of ripe raspberries with my cat watching me curiously, I felt like I was some sort of epic forager/gatherer type person. Remember how Katniss and Gale used to have special berry bushes that they would harvest for fruit? Sorry, did I just nerd out on The Hunger Games just then? 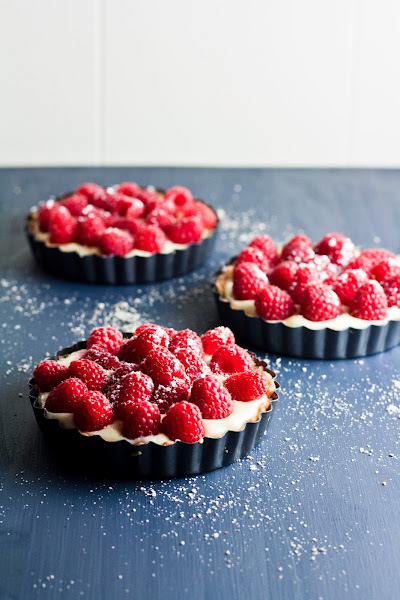 Eitherway, since the raspberries were so fresh from having been just picked from the bush, I wanted to showcase them in a recipe that left them in their oh-so-sweet and natural state. I've always been a big fan of raspberries and cheesecake, but didn't have the heart to bake these into the cheesecake batter. Which leads me to the final anecdote of the day: up until about an hour ago when I first started writing this blog, I thought the word tartlet was spelled "tartelette". You can see evidence of this in my instagram account, where I've tagged my photos of these tartlets with "tartelettes". It's honestly because one of my favorite bloggers is Helene from Tartelette — but it makes sense that she uses the French spelling of the word, because, hey, she is French. Anyway, although tartlets are traditionally filled with pastry cream, I'd been wanting to try New York City's famed Momofuku Milk Bar's recipe for liquid cheesecake for sometime now and thought that cheesecake would be the perfect compliment to this buttery and salty tart crust. Liquid cheesecake is exactly what it sounds like — cheesecake, baked just enough for the batter to cook, but not enough for it to maintain its structure. This means that it's still pliable and has the consistency of mayonaise; you can spread the stuff around like frosting. Use it to decorate cakes, build parfaits, or, in my case, make cheesecake tartlets. And when topped with freshly picked, summer-sweet raspberries and a sprinkling of powdered sugar? Heaven. The perfect summer snack. Speaking of summer, now's a good time to talk about my summer break. That is, during the months of July and August, my blog will be entering what I like to call a “summer slowdown”. Careful readers know that I follow a fairly regimented publishing schedule: two posts a week, one on Wednesdays and the other during the weekend. It's a lot to handle, especially when balanced with a full-time job, daily exercise (those baked goods do take their toll), and a social life. And with Oregon so beautiful in the summertime, I don’t want to be cooped up in my 1-bedroom apartment with no ventilation and a hot, hot, hot oven! No — I want to go see the ocean on the coast, hike on mountains with friends, and take road trips to nearby cities. I want to go on long runs and even longer bike rides on the weekend without stressing about what I’m baking and photographing afterwards. I'll still try and post in this blog once a week, but don't be surprised if you don't see me around as often. But don't worry! I'll be back in September. By then, I'll hopefully have mastered my Canon 5D Mark II and have even more photographs, recipes, and stories to share. For now, enjoy this recipe. Don't want to shell out for mini tartlet pans? No worries! Both the tart crust and liquid cheesecake recipe will work for a 9-inch tart pan. The tart crust is one of my favorite recipes from famed pastry chef Paule Caillat (as seen in Food52). It's a bit of a weird recipe for several reasons. First, the measurements are imprecise — there's no need to level the cup of flour that the recipe calls for. Second, it asks you to stick an ovenproof bowl full of butter and oil into the oven. Weird, right? But just trust the recipe. It produced a really delicate and non-fussy tart crust that will produce the perfect, buttery flaked texture. Like I said before, the cheesecake filling is adapted from Momofuku Milk Bar's Cookbook. Born out of head pastry chef Christina Tosi's love for underbaked cheesecake, it's another unfussy recipe that requires no bain-maries and just 15 minutes on low heat in the oven. Like I said, the perfect summertime snack. The cheessecake tartlets are best when topped with fresh fruit. You can replace raspberries with strawberries, blackberries, or any other fruit that you fancy and think will go well with cheesecake. In a Pyrex-type, oven-safe, glass bowl, combine 6 tablespoons unsalted butter, 1 tablespoon vegetable oil, 3 tablespoons water, 1 tablespoon sugar, and a pinch of salt. Once the dough is cool enough to touch, divide the ball of dough into four 5-inch tartlet pans. 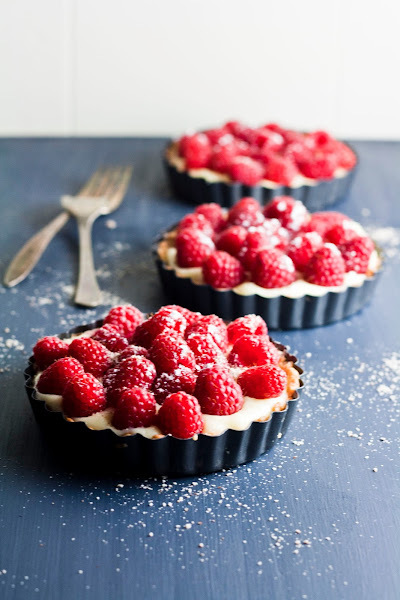 Use the back of your hand to flatten out the dough onto the bottom of one tartlet pan, and your finger tips to mold the dough up into the corners and sides of the tartlet pan. It's gonna feel really greasy and kinda unpleasant, but go with it. Use a fork to poke several holes into the crust. Repeat for the remaining tartlet pans. Bake the tartlets at 410 (F) for 6 to 8 minutes, or until the crust is light brown and starts to appear flakey. This crust is very forgiving — it should have hardly any cracks. At 15 minutes, remove the carefully from oven and let rest on a wire rack. Allow to cool completely; once it has cooled, the tartlets are ready for filling. In the bowl of a freestanding electric mixer fitted with a paddle attachment, beat 8 ounces cream cheese on low speed for 2 minutes. Scrape down the sides of the bowl with a rubber spatula, and add 3/4 cup granulated sugar in a steady stream. Once all the sugar has been added, mix for 1 to 2 minutes until the sugar has been completely incorporated. Scrape down the sides of the bowl. In a small bowl, whisk together 1 tablespoon cornstarch and 1/2 teaspoon kosher salt. Whisk in 2 tablespoons whole milk in a steady stream, then whisk in 1 egg until the mixture is homogenous. With the freestanding electric mixer on medium-low speed, stream in the egg mixture that you just created (from the third step). Continue mixing for 3 to 4 minutes, until the mixture is smooth and loose, scraping down the sides of the bowl occasionally. Line the bottom and sides of a 8 x 8-inch baking pan with aluminum foil. Pour the cheesecake batter into the pan and transfer to the preheated oven. Bake for 15 minutes before gently shaking the pan. The cheesecake should be firmer and more set towards the edges of the baking pan, but still jiggly and dead loose in the center. If the cheesecake is jiggly all over, let it bake 5 minutes more. If the cheesecake rises more than a 1/4 inch and begins to brown, take it out of the oven immediately. On a wire rack, cool the cheesecake completely to finish the baking process and allow the cheesecake to set. The final product will resemble a cheesecake, but it will be pipeable and pliable enough to easily spread while still having body and volume. Once cool, use a cookie scoop or a rubber spatula to evenly divide the cheesecake between the cooled tartlet shells. Chill in the refrigerator for 2 to 3 hours before serving. 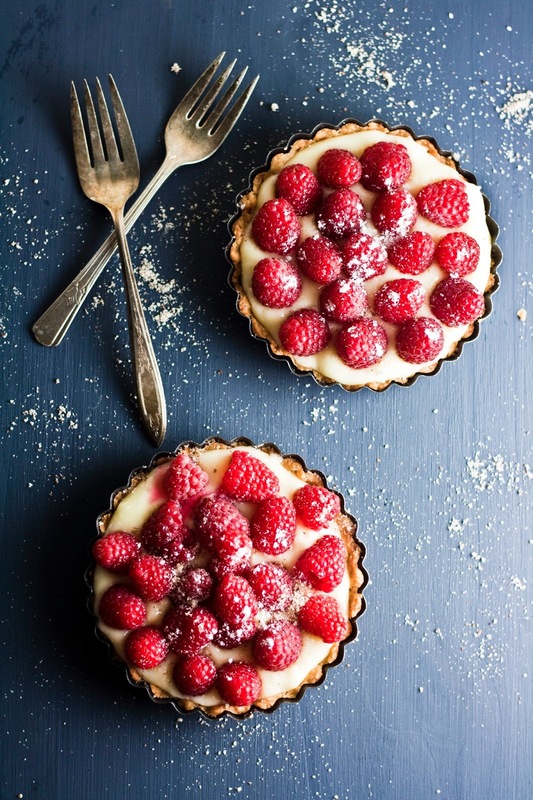 Once ready to serve, divide 1 pint raspberries between the tartlets, placing the raspberries on top of the cheesecake filling. Garnish with 2 tablespoons confectioner's sugar and serve immediately. Big congrats on your new camera! You are a very lucky girl. And those tartlets look incredible! I think you should stick with the French spelling of tartelette. Terribly sophisticated. Austin's parents have raspberries growing in their backyard and we just picked a bunch a couple of days ago - I should try this out! 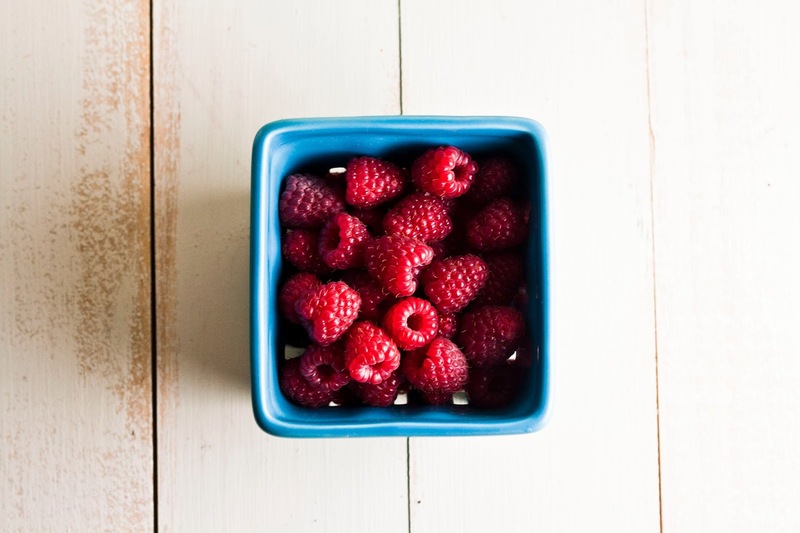 Liquid cheesecake sounds really intriguing and such a great way to use those gorgeous ruby-red raspberries. This is the perfect summer dessert really isn't it?